Everyone is using mobile apps for their business, irrespective of where they stand in their entrepreneurial journey. Building a mobile app is not just for the big conglomerates, the small to medium sized businesses are catching up pretty quickly! 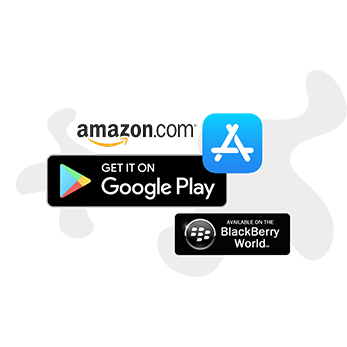 The situation today is such that the customers of every niche and strata have come to expect a mobile app for just about any product or service they need. How can mobile applications help you grow your small business? 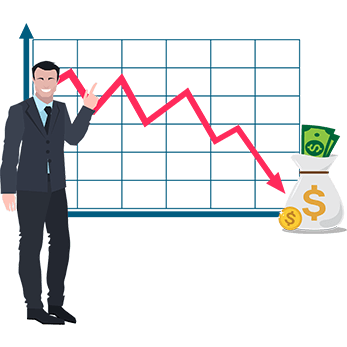 This is especially relevant when it comes to the ecommerce businesses who have limited the scope of their sales by only conducting their business using websites. It is high time now that the modern-day businesses especially understand the kind of relationship a modern-day consumer has with their phones. Spoiler Alert! It’s quite an intimate one! 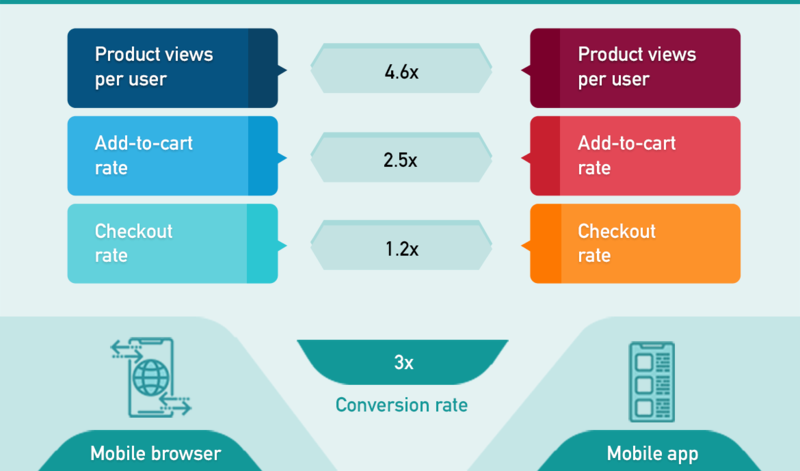 When you as an ecommerce business owner decide to tweak your core strategy to include mobile users as a target market, you expand the market and your scope of increasing the sales revenues exponentially. One of the ecommerce companies Touch of Modern actually reported an impressive 4x growth in their number of orders in the year that hey launched their mobile apps! Yes! That’s how much of a difference having a mobile app of your own can have on the bottom line. Let’s put it in numbers that are more interesting now. Let’s say for the purpose of convenience that earlier Touch of Modern was receiving 1,000 orders of $100 value each. This means, the introduction of a mobile app led to 4,000 orders, bringing about an increase of $300,000 order value! Majority of the ecommerce platforms that have a holistic digital presence with a website and a mobile app in their portfolio claim that a heavy chunk of their total sales come from mobile devices. For Touch of Modern this is 70% of the total sales. Also, this wildly popular, members-only e-commerce website and app, goes on to say that 57% of their purchases come from repeat customers. Clearly, their customer retention strategy is quite an effective one! However, that doesn’t mean they are behind in their customer acquisition numbers. They actually get somewhere around 150,000 to 200,000 new app downloads every month! This upward trend in the number of new customer acquisitions and the impressive percentage of sales coming from their mobile app, indicate that the brand is going to continue their growth in the coming years as well. 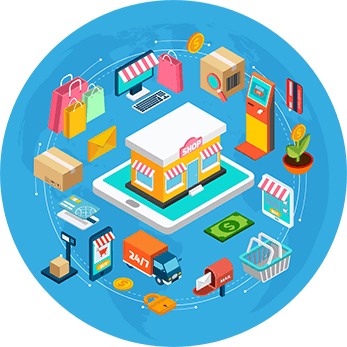 If yours is an ecommerce business and you are still only live on a website, it is high time you thought about getting into the field of m-commerce and build your own e-commerce mobile app and start using it to sell your products online. One important thing to remember here is that a mobile friendly or responsive website is critical, but definitely not enough. Here’s what we have on comparing mobile browsers and mobile apps. Quite clearly, mobile apps are doing better than mobile browsers everywhere! In addition to this, the average retail order on mobile apps is $10 higher than on mobile browsers. 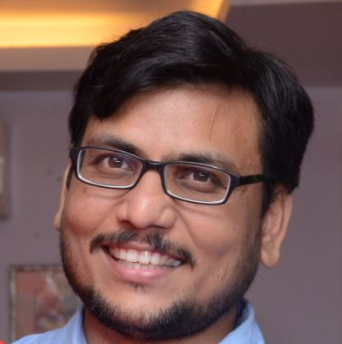 Hence the company would definitely see a steady growth as more customers would be spending more money through the mobile apps and converting at a higher rate as compared to mobile browsers. 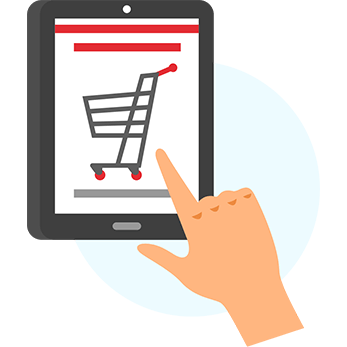 This can be attributed to the fact that in mobile apps the friction in the checkout process is bypassed for a smoother user experience. Customers who have converted once, can save their payment information in the app and check out in minimum number of clicks. It has been proven by industry leaders that developing a mobile app immediately takes the customer experience up several notches. When the customer experience becomes better, it is only natural that the customer retention rates go high up as well. And, we all know how important it is to retain our customers. One of the most apt and popular examples of this is the Starbucks app. Starbucks have managed to use their app in a two-pronged manner by using it to increase their retention and to drive sales. It is quite simple conceptually, but quite tricky to achieve. They have made sure that every feature, every element or aspect of their app is focused on offering a great customer experience. One of the features that has worked the best for them is the mobile payment option. This enables the customers to store their payment information so that they can make payments through in-app purchase functionality and don’t have to take cash or cards out. 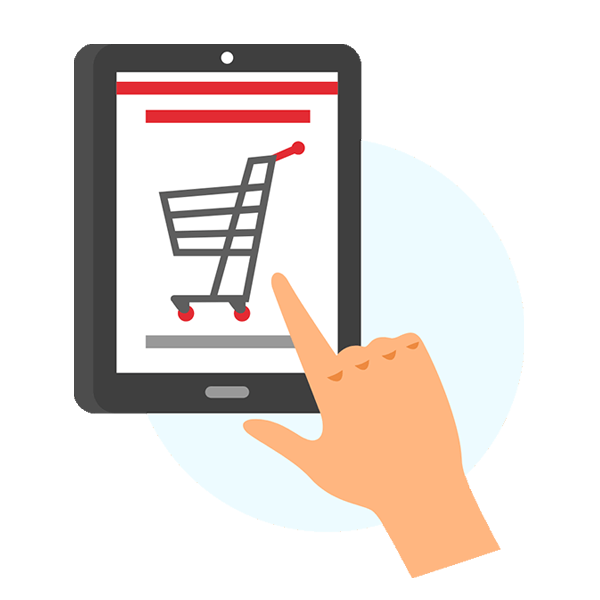 In this manner, the checkout process is a lot faster and convenient for the customers and the staff alike. Additionally, the app lets the users place their morning coffee orders from their mobile devices even as they are on the move and the card, they have stored on the app will be charged for it. This way when they reach the café, their order is waiting for them and they don’t have to wait in line or take their wallets or phone out to pick it up. In fact, Starbucks announced a little while ago that 30% of their transactions are done through mobile payments. Furthermore, the mobile order-ahead feature usage has grown up to 11% of the US transactions. This seems to be quite a promising trend for mobile apps even in the food and beverage industry. In fact in Q1 2018, they generated $6.1 billion in revenue and 30% of these transactions come from mobile payments. This indicates that their annual revenue from their app should be somewhere around $7.32 billion! Need we say it’s huge! This infographic here does a pretty good job at giving you an idea of the growth experienced by the company in context of the mobile app. 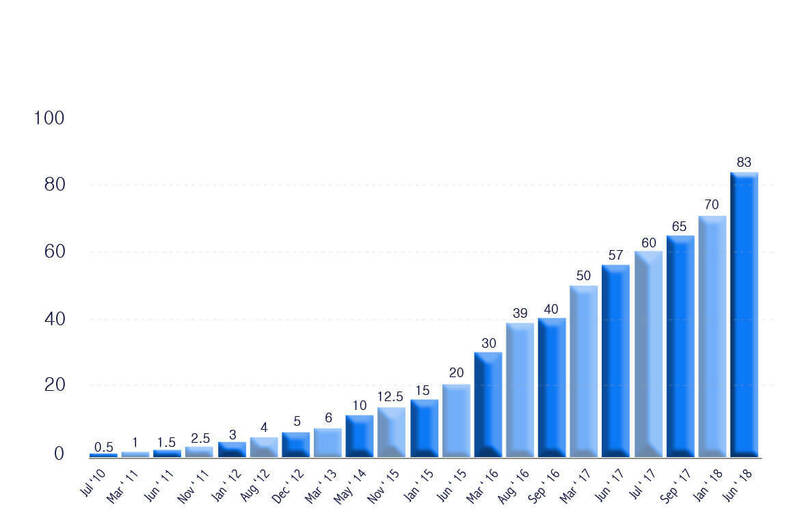 It actually goes on to give you a pretty exact view of what a mobile app development growth curve can mean for a company. The Starbucks mobile app was received pretty well by the entire audience and it was evident that they wanted to use their mobile phones to pay for their orders. Also, once they have the app on their phones, they had a reason to keep going back to Starbucks instead of let’s say Costa Coffee or their local coffee shop! Wait! There’s more! The app users tend to spend a lot more money than any other segment of customers. In fact, on an average a Starbucks mobile order is around 3 times higher than a conventional order. Furthermore, the customers who order their beverages through the app automatically receive reward points which can later be redeemed for attractive perks like free drinks, free refills, or drink upgrades. The customers have the freedom to customize their orders easily so that they can get exactly what they want! Also, they can send gifts to fellow app users, look at their order history, and manage the account. All this and more can be tracked from within the app. The loyalty rewards customers constitute about 36% of the total sales in 2017 and the trends indicate that the curve is only going to go up! Whether you have a café, a restaurant or any other service-based business model, building a mobile app can be a great channel for implementing a well-designed loyalty rewards program for your customers to improve the retention rates. The benefits of a mobile app for a small business extend beyond customer retention. So Let’s talk about a key element in running a small business – operational efficiency. The operational costs of running any business can sneak up and ruin the whole budget! For a small business especially this can be quite a drastic situation. A mobile app can help your business with your internal operations, inter-departmental communication, and can help you bring down the associated costs. Now there are multiple companies who are working with a majority of their employees in the field or from home. The work environment has become such that a good number of employees work remotely. This can be a real nightmare when it comes to in-office or inter-departmental communication. Making calls all the time to the office to clarify a hundred things in a day can only bring in a certain inefficiency to the system, not to mention the costs attached to it. 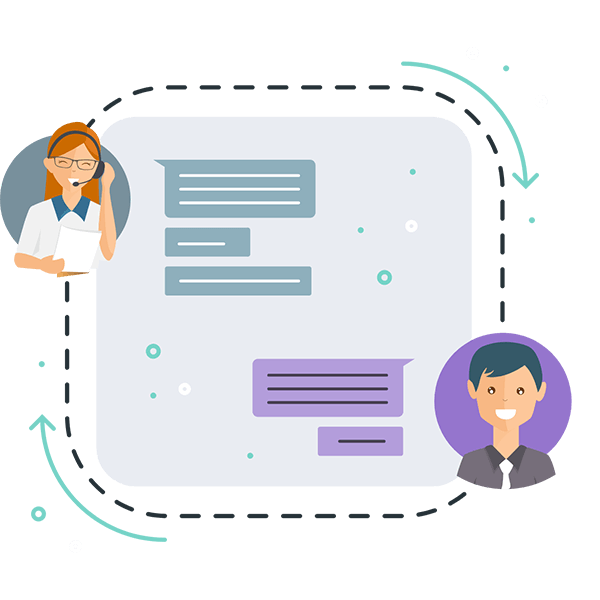 For a new age business, it is important that there be an effective channel of communication that can help the departments or teams stay connected to each other without much of an effort or hassles. A mobile app developed for this purpose can fill this gap and create a smooth and effective channel of communication. Hence, instead of hiring people to man the phones, answering every little question from employees in the field or working remotely, you as a business owner free up valuable resources to do other more valuable work. This one little step is enough to keep the employees engaged and connected to the organization which in turn keeps them motivated to perform better and bring in better results. So, in case you are running into any operational inefficiency within your office, a mobile app can turn out to be a lifesaver for you. Like we mentioned earlier, a mobile app can bring about a definite growth in business in more ways than one, beyond targeting customers. 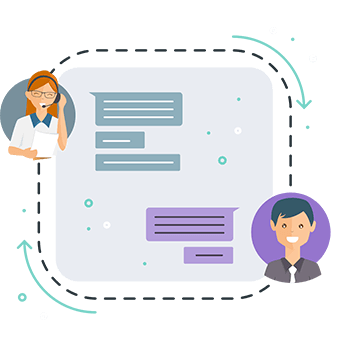 A strong channel of communication mobile apps have an inherent ability to bring about a smoother flow of operation which directly brings down the overall operational costs. A great example that I can quote here is that of Cumberland Farms. With over 500 gas stations and retail store locations, the organization employs more than 6,000 employees and generates an annual revenue of more than $16 billion. What is surprising is that even for a company of that scale had some room for improvement in their processes. Their biggest problem was that, each of their location housed massive amount of records – all on paper! Yes, even in this day and age, that is how they maintained their records including things like work orders, timesheets, inventory, and even inspection records. The list of these paper records did not end at this. If you have ever dealt with paper records in this scale and proportion, then you obviously know what kind of a challenge it can be to handle it all. It is tough to keep a track of it all which means the processing times can extend for really long durations. Hence, as Cumberland Farms began gaining scale, their processing progressively slowed down. To simplify matters and make the processes smooth, the company decided to launch an app and the biggest advantage they quote is that they were able to save a huge operational cost. The company began the process by creating mobile forms within the app for a number of critical things like parts requests, managing inventory, and guest reports. The results seemed quite promising, thus motivating them to continue investing in their mobile apps. Today they have over 20 different mobile forms within the app and are moving towards going paperless. This would not only improve their internal operations but also save you a lot of money in the process. Building a mobile app to deal with all their forms was a decision solely responsible for reducing the costs of operation by more than $11,000 every year. To top it, they also ended up saving 845 work hours every year! At the end of it, when they took a step back and looked at the big picture, they discovered that they were now benefiting from more than a $400,000 return on their investment. Now, you may be a much smaller business and your expenditure on paper records may not be of a comparative scale. However, there are multiple such practices in your day to day operations that can be avoided or tweaked to save substantial costs through a mobile app for your business. 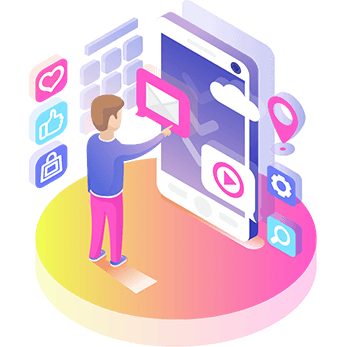 The first step for you here would be to list out the most expensive and most inefficient aspects of your business operations, so that you know the exact intent of your mobile app. To drive my point home, here I am going to talk about Spotify. Hold on! I am not saying that your business will turn into something as huge or comparable to Spotify. However, what I am going to talk about here applies as effectively to small businesses as well. It is unrealistic for most of the small businesses to assume that they are going to become the next Spotify and I totally acknowledge that. However, when it comes to their business model, it is something that has been proven to work for a great number of different businesses across different industries. If you have a subscription-based business model and are looking for effective and economical ways of driving conversions, building your own mobile app can be the perfect solution for you. Offering multiple tiers of subscription, you can offer the basic tier for free – quite like Spotify. When you use an app to offer a subscription-based business model to your customers, you are more likely to convert customers as compared to offering a product upfront. In fact, it has been established that 60% of the free trial users will convert into paying customers. Using your mobile app, when you set up subscriptions you can easily fatten up the revenue streams to grow at an impressive rate. This way, users can save their payment information in the app in a safe way and you as an app owner have better chances of converting and retaining customers as they opt in for an auto-renewable subscription. Using this particular model, Spotify has managed to grow their business to 170 million monthly active users. Now, it is often misconstrued that to make money from your app in the app store, you have to charge your customers for your app. This is far from truth and Spotify has proven it beyond doubt. The Spotify app can be downloaded by the users for free and they can upgrade to the premium plans on the basis of their taste and preferences. Spotify claims to convert 27% of their free trial users into customers and have a fairly high retention rate. The graph above clearly establishes the fact that you do not have to charge for downloads to earn some money in the app store. Though it might not be fair to expect every small business to gain the scale and turnover of Spotify, but it is a good idea to apply their business model on a business of any scale. It really works! On-demand marketplaces are quite the craze today and the customers are enthusiastic about it too! Whether it is Uber, Lyft, Grubhub, Postmates, or something unique that you have in mind, it is the mobile apps that can make it happen. 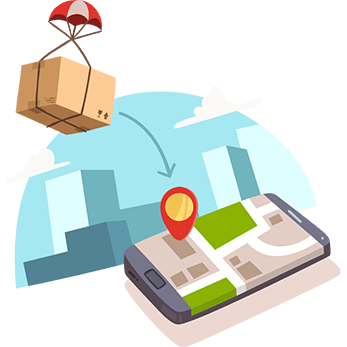 However, having said that you don’t have to launch an entirely new line of business if you want to create an on-demand marketplace mobile app. Even if you have an established online business in place, you can create an on-demand marketplace to expand your business through a mobile app of your own. One of the companies that did it really well is Rover. The company offers services like dog walking, dog boarding, doggy daycare, dog visits, and even house sitting. Previously, they only had a website and were looking for ways to improve their business. Once they launched a mobile app of their own, Rover was able to expand their reach and presence to more than 11,000 cities. In addition to the geographic expansion, the company also saw an impressive 200% increase in user registrations. At the time when the app was performing the best, there were about 10,000 people joining in on a weekly basis. The company reports that 90% of the users who installed their app and booked a service with them through the app are still active users of the app. Also, more than 90% of the Rover app users recommend it to their friends and family. This is a massive outcome for the business and this kind of a turnaround only happened because they chose to improve their existing services using a mobile app. Between the years 2016 and 2017, the company has managed to triple their net revenue and this boost has been a great help in letting them reach out to new markets. This is why Rover can look towards expanding to Europe. Now, the significance of this figure can only be understood when you observe that more than 80 million households in Europe own a pet and 30% of the total global pet spending can be attributed to this single continent. The total amount of annual gross bookings on the platform stands at around $375 million and the company keeps 20% to itself. This means the annual revenue for Rover translates to about $75 million in revenue for the company. Last year, 2018 the valuation of the company stands at around $970 million and that is largely due to a big surge in mobile app downloads and usage. The mobile apps for Rover came with a set of unique features that the users didn’t have access to on their website. The app they made actually managed to address a user need and come up with a viable solution. 83% of the pet owners had concerns that the dog walkers they were hiring were cutting corners. Rover recognized this particular need and came up with a feature within their app which allowed the pet owners to track the walkers using GPS. In this way they are assured that the walkers are walking the promised distance in the time they agreed upon. As the company plans to expand to the European market, this feature is going to be a great help. As a new product comes into an established and kind of an over-populated market, the comfort and trust factor that it can generate initially is critical and this new feature is a great step in that direction, adding great value to their product. Now, you can take a lesson from Rover and instead of starting an entirely new business with a mobile app, you can use it to improve your current business model and you would be surprised at the numerous opportunities presented to you. When you build an on-demand marketplace with your mobile app, do it to enhance your existing mobile app. The whole idea of building a mobile app for your business is to find new ways to make your content easily accessible to their customers. When you have a mobile app, and if you can offer enough value through the mobile app, the customers would have a much easier access to all the offerings, content, services, or any kind of content you have for them. This can best be explained with the example of Marriott Hotels who have over 4,000 properties of 5-star category in more than 80 countries. In 2012, Gillray’s Steakhouse & Bar was opened in one of Marriott’s 5-Star locations Marriott County Hall, London. This one was a steakhouse, but a high end one. This is why they were eager to separate themselves from all the other steakhouses in London. The one step they added to their strategy was adding a mobile app, making their content easily accessible to prospective customers in the area with a mobile app. This directly helped the location and the new steakhouse grow quickly in popularity. The Gillray’s Steak & Gin app lets the users make a reservation at the steakhouse, see the daily and weekly specials, use a timer for cooking the perfect steak at home, and even find instructional cooking videos that work online. The biggest takeaway from this example is that even a business that has just the one physical location and sells nothing online can leverage a mobile app for the expansion of their business. The first conversion where you convert a visitor to a paying customer is one of the toughest things and one of the more expensive steps. Now, after you have crossed that bridge and are looking for multiple following transactions from these one-time customers, it can turn into quite a nail-biter. The cost of acquiring a new user is only justified when they keep coming back for more! Let’s take the example of Asda – a British supermarket. According to the market share, Asda is the second largest chain in the UK and has over 500 locations. When they came up with the strategy of adding a business mobile app, the intent was to add convenience to the whole shopping experience for their customers and to increase the number of online orders they were getting. Like any other iconic decision-making process, the company conducted an in-depth customer survey which revealed that their current customers were looking for a mobile app that would have features like Store Locator, Barcode Scanner, Recipe Finder and more. This is exactly what Asda offered with their app and the app has gotten more than 2 million downloads now. This is simply because consumers prefer mobile apps over mobile websites, and we have a fair idea why. After launching their app, Asda came to the revelation that 90% of their grocery orders were coming in from the app. This only meant that they were able to accomplish their first goal, that is of increasing the number of their online orders. They, in fact were taken by surprise as they surpassed the goals they had set for themselves. They had hoped that the mobile sales would contribute 10% of their total revenue and the percentage numbers almost reached the double, jumping up to 18% of the total annual revenue. The shopping frequency on mobile have found to be 1.8 times more than the desktop shoppers and the customers who shop from their apps do so at almost twice the frequency of a mobile site! 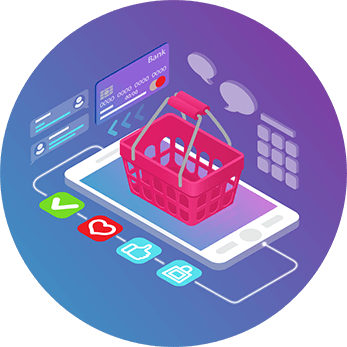 What I’m trying to tell you here is that if your business involves selling things online or even in physical stores, building a mobile app can effectively increase the shopping frequency of customers which finally contributes to the growth in revenue. Building an app and including it in the growth strategy for your business makes sense, no matter which niche your business belongs to. Like we discussed in the article above, a mobile app can help you to grow your business in more ways than one. The examples we have taken up in this blog post are all wildly different from one another and each of them took up app development with a different objective in mind. But, at the end of it all, all of them were able to register a significant growth as a result of it. It would therefore be safe to say that no matter what niche you belong to and irrespective of where you are at in your business journey, a mobile app is a great way to grow your small business. If you think building an app is an expensive affair or that it would involve years of work during which your resources would dwindle down, it’s time you thought about Appy Pie. Building your own mobile app for your small business is super simple with Appy Pie and it doesn’t even need you to learn any coding. Furthermore, our small business app builder is available for a really affordable pricing plan! What’s stopping you then! Get Started Now! If you can think of any other way in which a mobile app can help grow a small business, we would be happy to hear it. Leave a comment in the section below and share our article with friends who would benefit from it! A responsive website is a web design approach that makes website pages render well on different mobile devices. Customer retention refers to the ability of a company to retain the customers and increase repeat business. Customer acquisition refers to the process of gaining new customers for a product or a company. The subscription-based business model is a business model in which customers need to pay a recurring fee for accessing business products and services. The on-demand marketplace is the marketplace that can only thrive through regular growth in two different groups - buyers and sellers. Both these parties value immediacy and are dependent on the merchant to facilitate the transaction. Mobile apps truly have revolutionized the way small businesses function today. It’s interesting to see some of the insights in the blog. I actually wait to see the blogs posted over here! I love this article.. Thanks Appy Pie for sharing this. Very interesting, good article and thanks for sharing such a good information. Great information. I will check out the rest of your blogs. Nice post with some great info. I think a lot of people will find this super useful for their business. Thanks Guys! We strive to deliver value with each post we put up here!